During the first ever “two-plus-two” Ministerial level parleys between the Secretary of State and the Defence Secretary from the US and the Minister of External Affairs and the Defence Minister of India held on September 6, 2018, in New Delhi, an unequivocal assurance was made available that India means business when it comes to acquisition of vital military hardware. “The Ministry of Defence has approved acquisition of 24 Anti-Submarine Warfare and Anti-Ship MRH (Multi-Role Helicopter). 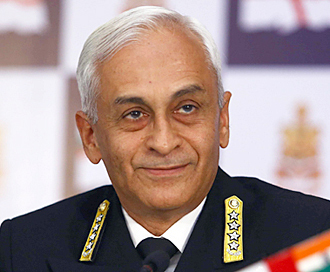 The case is being processed through FMS.” —Admiral Sunil Lanba, Chief of the Naval Staff, while speaking to Jayant Baranwal, Editor-in-Chief, SP’s Naval Forces during an interaction on November 8, 2018. Seaking helicopters acquired from the UK way back in the early 1980s have served the Indian Navy extremely well and way beyond their best capabilities over the past three and a half decades. Critical shortage in this vital segment of Anti-Submarine Warfare (ASW) capabilities with the frontline ships of the Indian Navy has reached truly alarming proportions. 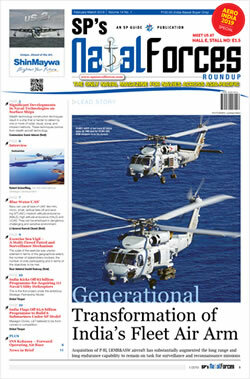 Multi-Role Helicopter (MRH) is the backbone of the operations at sea and its critical void can hardly be supplemented by any other platform for the fleet. As an interim measure a highlylimited inventory of twelve upgraded Seaking 42B and 10 Kamov 28 ASW helicopters are being rotated among the frontline ships of the two fleets during operational deployments, exercises, missions, etc. It is an open secret that the biggest threat to India’s maritime interests and its surface fleet comes from enemy submarines. While every warship has hullmounted sonar for tracking submarines below the surface, the potency of ASW helicopters to counter the sub-surface threats is unmatchable. Hence, it is imperative that the widening gaps in the ASW capabilities are abridged through acquisition of potent MRH in the shortest possible timeframe. Adverse hydrological conditions and currents in the Arabian Sea, Bay of Bengal and the Indian Ocean impinge on the detection capability of the hull-mounted sonar. Conversely, the ASW helicopters with their dunking sonar capability prove far more effective and accurate under such conditions. ASW helicopters prove a better platform as these can not only hunt a submarine, its own detection and hunting down by a submarine is very nigh impossible. More than a decade ago, the Indian Navy began the process of finding a suitable replacement for the Seaking ASW Helicopters by floating a global tender for 16 helicopters with an option clause for another eight, in 2008 for its warships and for upgrading diminishing ASW capabilities of her fleet. In the open bidding process, the US firm Sikorsky was selected in December 2014. Sikorsky emerged as the sole successful bidder, after the Italian firm Finmeccanica was ruled out of the competition due to the allegations of scam in VIP helicopters deal by the Government of India. Seahawk S-70B was selected for its advanced ASW and anti-surface warfare capabilities to take on the underwater and over the surface threats. 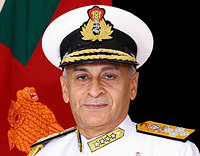 For more than six years the Indian Navy persisted with the Government for early conclusion of the contract, but to no avail. Finally, despite the ‘Dissent Note’ from the Indian Navy stating that these helicopters were critically required to bridge the operational capability gaps, the Ministry of Defence (MoD) fore closed the procurement of 16 S-70B Seahawk helicopters from Sikorsky. To enhance the capability of Multi Role Helicopters at sea which the Indian Navy has been harping on for so long, finally the Defence Acquisition Council (DAC) in its meeting on August 26, 2018, has approved procurement of 24 MRH. Availability of MRH with the Navy would plug the existing capability gap which is the most critical need of Indian Navy. This DAC approval could not have been taken at a better time than this. During the first ever “two-plus-two” Ministerial level parleys between the Secretary of State and the Defence Secretary from the US and the Minister of External Affairs and the Defence Minister of India held on September 6, 2018, in New Delhi, an unequivocal assurance was made available that India means business when it comes to acquisition of vital military hardware. This contract when fructifies will be another direct Government-to-Government (G2G) deal, also known as direct Foreign Military Sale (FMS) with the United States and worth approximately $1.8 billion. MH-60R helicopters are also designated as Seahawk multi-mission helicopters, capable of ASW and anti-surface warfare roles. Consequent to approval of the Government a “Letter of Request” was issued on Thursday, November 15, 2018, to the US Government to acquire 24 Naval Multi-Role, MH-60 ‘Romeo’ Helicopters at a cost of 13,500 crore (approximately $1.8 billion). The request for the helicopters is made as an “Urgent Requirement”. The MH-60R, Seahawk considered the world’s most advanced maritime helicopter will be armed for the ASW and anti-surface warfare role and will be duly fitted with missiles and torpedoes. The acquisition of MH-60R Seahawk will substantially enhance the multi-mission capability of the frontline warships of the Indian Navy to some extent, as it would very partially meet the overall requirement of Indian Navy in this segment. The Government-to-Government deal for the MH-60R Seahawk, manufactured by Sikorsky-Lockheed Martin, under the US FMS programme is expected to be concluded within a year. The FMS route for acquisition of military hardware from the US is considered most efficient, much swifter and cleaner than the cumbersome global tender process, which takes several years and is often derailed by allegations of corruption in India. 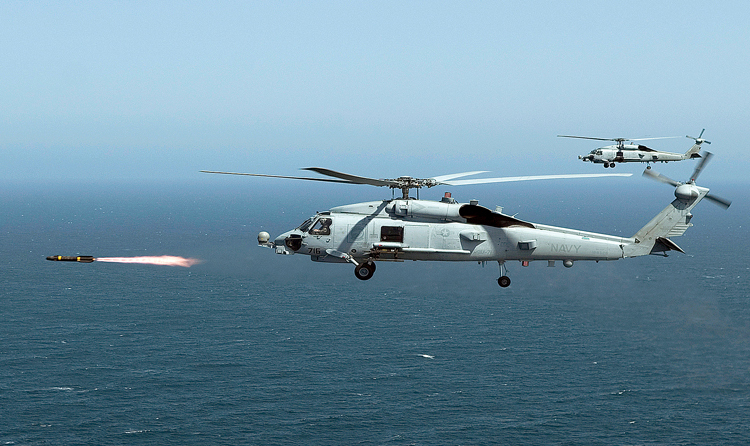 The induction of these heavy-duty MH-60R Seahawk in the 2020-2024 timeframe will come as a shot in the arm for the Indian Navy, whose warships are virtually bereft of such helicopters. Conclusion The acquisition of 24 MH-60R Seahawk helicopters opens new vistas for the Indian Navy’s long-term requirements for 123 Naval Multi-Role Helicopters (NMRH) and 111 twinengine armed Naval Utility Helicopters (NUH) programmes under the ‘Make in India’ initiative and in partnership with the indigenous Private Sector. The US is also very keenly pursuing its interest in the Indian Navy’s programme for acquiring 57 carrier borne multirole fighters. Likewise, the US, of course, is in prime contention to bid for its F/A-18 or F-16 fighter production lines in India for the IAF’s over $20 billion ‘Make in India’ programme for 114 jets. In addition, India is very keen to acquire 22, armed Predator-B or weaponised Sea Guardian drones from the US. Timing for issuing the “Letter of Request” is quite significant with a view to obtain expeditious clearances. Firstly, albeit not confirmed yet, there is a possibility for a summit-level bilateral meeting between Prime Minister Narendra Modi and US President Donald Trump in Argentina on the side lines of the G-20 meet scheduled on November 30 and December 01, 2018. Secondly, Defence Minister Nirmala Sitharaman is also expected to be in the US for talks during the first week of December 2018. Both of these parleys are expected to provide desired push and clear possible roadblocks to the current and future bigticket acquisition plans with the US.